with a retreating enemy in front, the bodies had in many instances been hurried into a shallow trench, and a few shovelfuls of earth, hastily heaped over them, served the purposes of interment, while the carcasses of horses partly consumed, or charred by the fire, were profusely scattered over the field. Although the remains of many of those who had fallen in the battles and skirmishes preceding this bloody conflict had been decently interred in the hospital graveyards, and their names had been properly recorded, still many of the slain buried on this spot were entirely unknown, and owing to the necessarily hasty and imperfect manner in which they had been interred, their bones, in numerous instances, were uprooted by the swine or overturned by the ploughshare, and left to bleach upon the surface of the ground which had been consecrated by the heroism of their deeds and the prowess of their arms. Humanity required that duty, delayed already too long, should take action in some shape, and to the HON. 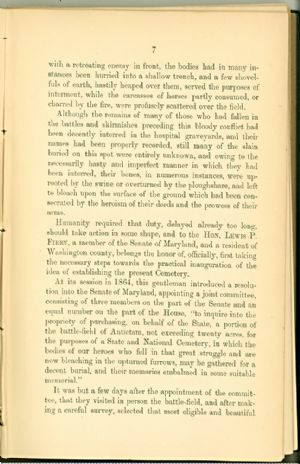 LEWIS P. FIREY, a member of the Senate of Maryland, and a resident of Washington county, belongs the honor of, officially, first taking the necessary steps towards the practical inauguration of the idea of establishing the present Cemetery. At its session in 1864, this gentleman introduced a resolution into the Senate of Maryland, appointing a joint committee, consisting of three members on the part of the Senate and an equal number on the part of the House, "to inquire into the propriety of purchasing, on behalf of the State, a portion of the battle-field of Antietam, not exceeding twenty acres, for the purposes of a State and National Cemetery, in which the bodies of our heroes who fell in that great struggle and are now bleaching in the upturned furrows, may be gathered for a decent burial, and their memories embalmed in some suitable memorial."